According to Bon Appetit Magazine lamb is trending right now. I’m not surprised, it’s a tender meat that’s flavorful yet not heavy when prepared well and simpler than you think. Leg of lamb is not as fatty as lamb shoulder, nor as gamey tasting and you just can’t get enough. 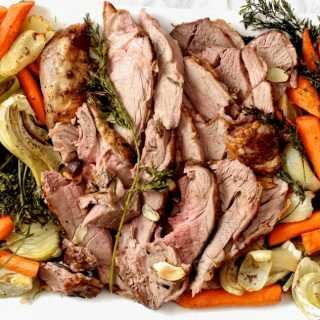 With Passover and Easter just about here, what better way to celebrate than with a simple rustic style meal of leg of lamb with fennel, onions, and carrots to please a crowd – a lighter meal allowing room for dessert! For those not a fan of fennel’s strong licorice (anise) taste, the roasting eases up on its’ strong flavors that I encourage you to try. 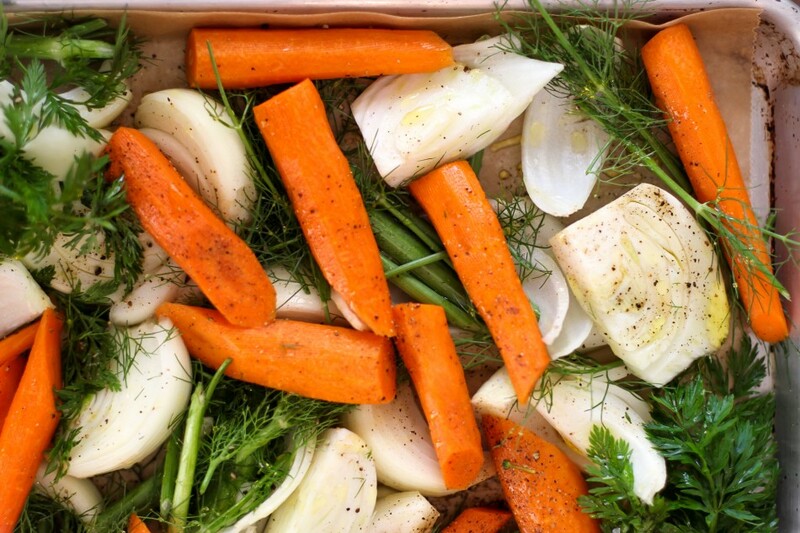 Lamb pairs so well with a simple blend of fennel, onions, and carrots. Some other well-paired alternatives would be asparagus, parsnips, spring onions, or baby turnips. Easy yet impressive holiday meal that is foolproof – YESSSSS. Quick tip: plastic squeeze bottles make for easy drizzling. I keep one for olive oil, avocado oil, sherry vinegar, coconut oil – the drizzling options are endless! Roasting ‘bone-in’ adds extra flavor and fit for a holiday dinner, but not always available. If unavailable, boneless lamb is a tasty alternative. Don’t discard the bone! Freeze the bone to add to a future soup – it will add depth to beef, or turkey broth. Some leg of lamb has a thick layer of fat, which may produce a gamey mutton-like taste, ask your butcher to remove some of the excess fat. There is a difference between the USA and New Zealand lamb: USA lamb is grass-fed and usually grain-finished. It’s has a milder, slightly sweeter taste with a little more fat to it. New Zealand lamb is fed rye and grasses. It’s leaner, smaller and slightly gamey tasting. Marinating lamb can make the meat tough. Cooking time is similar to turkey, about 20 minutes per pound for medium. Check the internal temperature with a thermometer to ensure doneness to your liking. Keep in mind, resting the meat will raise the internal temperature about five degrees so slightly undercooked is okay! There, I think that should do it. Enjoy! 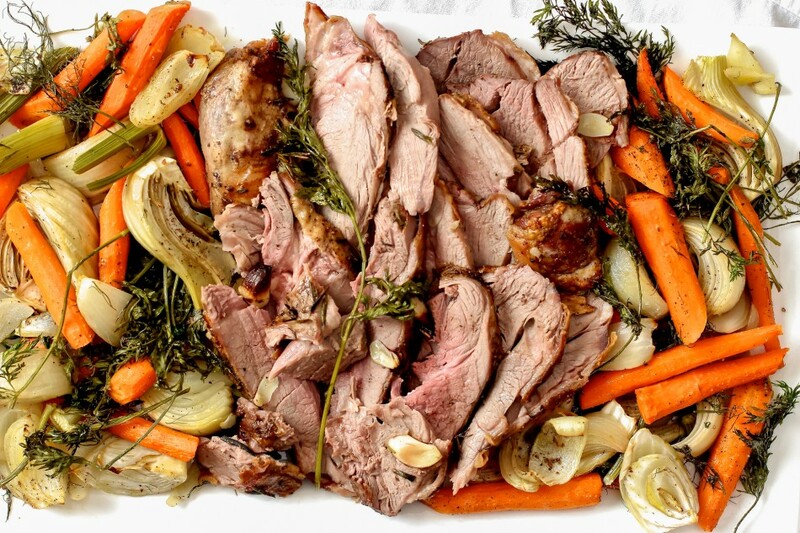 A no-fuss AND easy Passover or Easter holiday leg of lamb with roasted vegetables to serve a crowd is always a winning combination! Versatile enough to pair with any sides, low carb and paleo friendly too! Note: cut vegetables in similar size to ensure even cooking. Preheat the oven to 400 degrees F (204 C). Set a rack in the middle of the oven and one below it (for the vegetables). Transfer all the cut vegetables onto a baking sheet, evenly season with salt and pepper, then drizzle with olive oil (about 2 tablespoons). Gently mix by hand to evenly coat both sides. Set aside. Pat lamb dry with a paper towel. Season liberally and evenly to create a light coating of salt and black pepper (as if a slight sprinkling of snow), same on the other side. Transfer to the second parchment lined baking sheet. 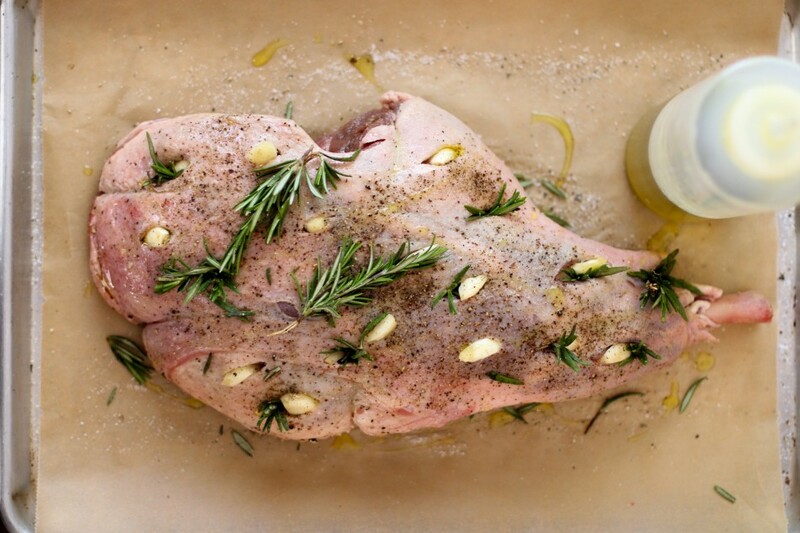 Place 6-8 cloves in the middle of the second rimmed baking sheet, place lamb directly over the garlic. With the fat side up, cut one-inch indents throughout and stick cloves of garlic and pieces of rosemary sprigs into the indents. Then drizzle 1-2 teaspoons of olive oil over the top and rub it into the meat. 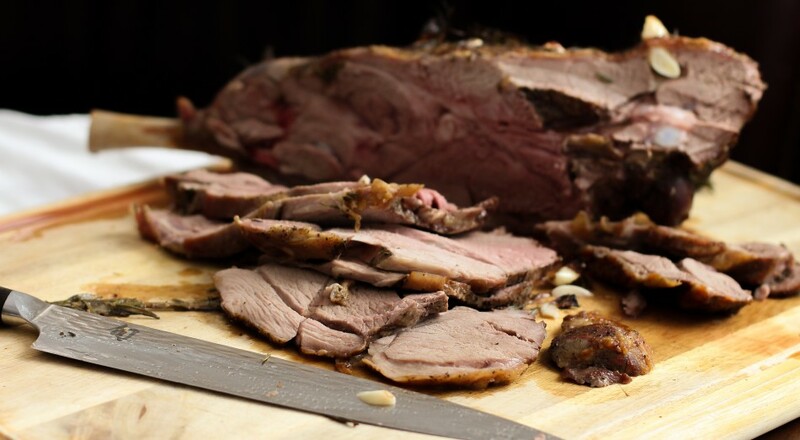 Roast lamb at 400 degrees F for 55 minutes, then reduce heat to 350 degrees F (175C) and roast an additional 35 minutes. 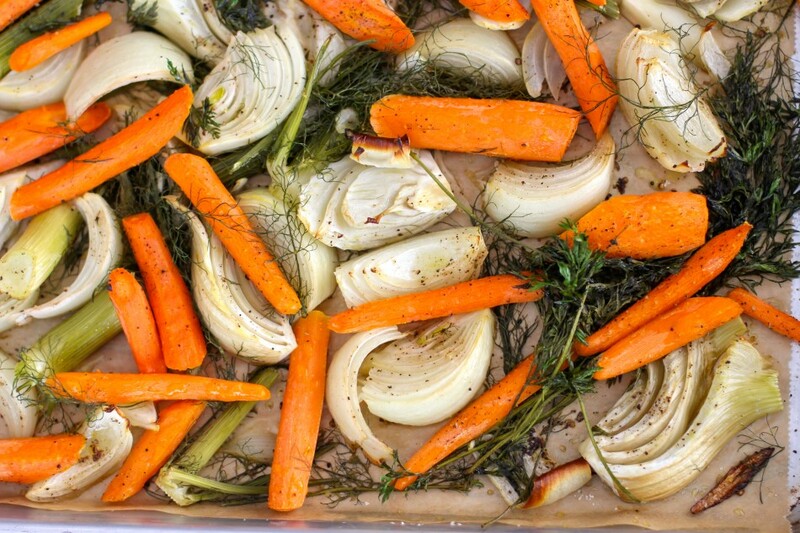 When reducing heat, add the vegetables into the oven. Roast for the 35 minutes time remaining for the lamb, then increase the temperature to 400 degrees F (vegetables still in) to roast vegetables an additional 15 minutes. This will brown the vegetables further while the meat rests, to serve simultaneously. Note: You may be wondering why not cook the lamb at a lower temperature, consistently? I have learned years ago (from Thomas Keller’s cookbooks) that the higher temperature seals in the juices, which keeps the meat moist and the outside crispy - same goes for poultry. Although many recipes suggest roasting at 325 degrees F, I always had lamb that was overdone around the edges yet raw in the middle. This method cooks the lamb medium rare by the bone, medium throughout most of the meat and some well-done end tips - a piece for everyone! 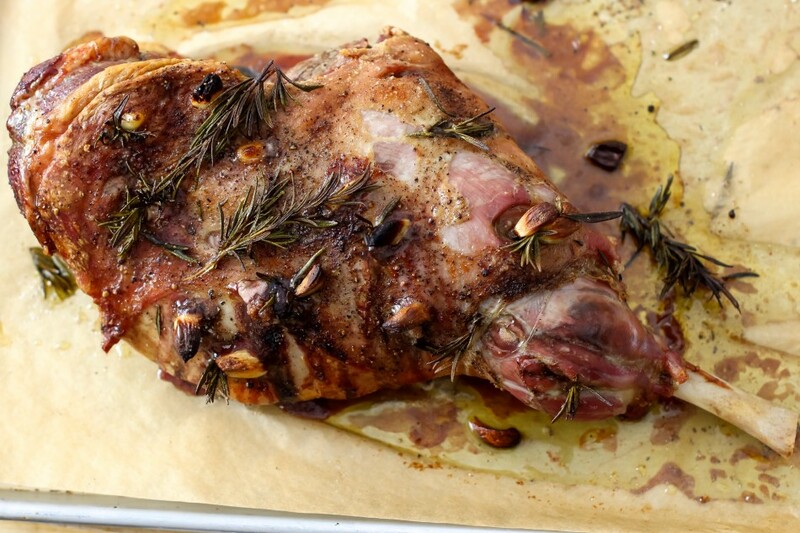 When the lamb is done, cover with aluminum foil and let it rest 15 minutes before slicing. Slice against the grain (you may need to maneuver angles as the grain usually shifts), with the garlic pieces intact (or remove if desired). Serve hot with roasted vegetables. To reheat: transfer to an oven safe platter, cover and reheat for 15 minutes, or until hot, in a 300 degrees F oven. Transfer to a baking dish and serve with lamb. What a plate of heaven! I always throw away carrot tops and thought it's only for rabbits. What does it taste like? I have never seen radishes like that!! Gorgeous salad to go with my honey glazed salmon I'm making for Easter brunch! Have fun in New York with your family! Ah Just realized i commented the wrong recipe! Whoa, this looks better than anyblamb I've made before!! I usually bake at 325 degrees, huh that may be why it usually looks steamed. I will be trying your recipe for seder dinner. Thanks for sharing your lamb tips too!! I can eat that whole plate! I didn't think lamb is this easy to make. I can't wait to make this with crispy ends that I'm obsessed with! How many pounds for the cooking time? Oops, I will note that in the recipe, sorry! It's for a 4 1/2 pound. Jessica, my lamb came out beautiful and delicious! The amount of salt you indicated was a little concerning but did not make the lamb salty at all. My lamb was 5 pounds and I cooked it for 1 hour 45 minutes and let it rest 15 minutes. It came out medium rare with medium ends. Great recipe, thank you! Made the leg of lamb with fennel and carrots (we don't like roasted onions) separately. My lamb was 4 1/2 pounds and I cooked it for 90 minutes with crushed garlic on top instead of pieces of garlic (we love garlic). Needless to say it came out great and cooked perfectly! I was proud to serve this to my in-laws and grandparents for lunch today! I made this tonight following the recipe to a T. I was nervous about using as much salt as you do so I cut it in half. When I began to cut it after letting it rest 30 minutes it looked like it was going to be dry. As I cut into it further it went from medium well to medium rare and cooked perfectly with different doneness to please my family. For the salt I see why you season it that way and will next time; mine was somewhat bland so I sprinkled salt on the slices. Overall good recipe and instructions. Vegetables came out delicious. Will be roasting this way from now on :) Happy I came across your blog!